So you’ve found the one. You want to spend the rest of your lives together. You’re in love and you want everyone to know it. She said yes (or maybe you did!) Now it’s time to celebrate! Now that you’re engaged, you want all your friends and family to share in your joy. 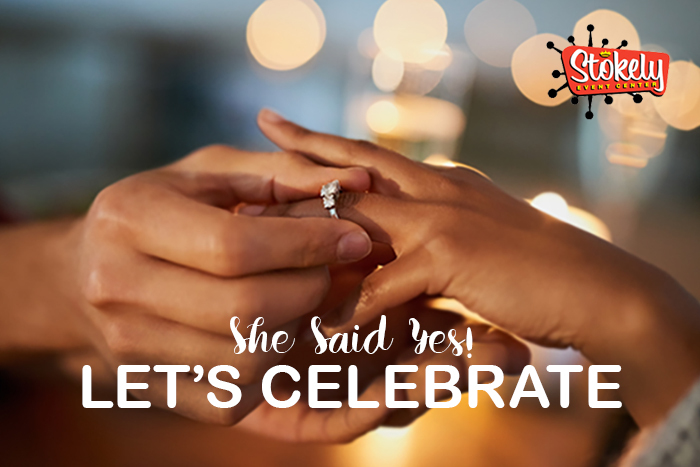 Make your engagement party unforgettable at Stokely Event Center. Here are some tips for planning your engagement party. Usually, this is the bride’s family, but you’re free to do it your way. Some couples want to make it their own, so parents take a back seat. Sometimes it’s the groom’s family, and sometimes it’s a group effort. Just make sure you communicate with everyone so your plans are clear. You want a venue that is fun, flexible and has plenty of room for your guests. Of course, we recommend you have your party at the Stokely Event Center in Tulsa, Oklahoma. Let us help you make your event unforgettable! Give people you want to involve ample lead time to attend. Talk with both sides of the family and try to set a couple of dates everyone can agree on. Then check with your venue to finalize. Make the menu something that reflects your personalities. Maybe food from a favorite restaurant or where you met. Perhaps the cuisine from somewhere you’d like to honeymoon. Don’t forget to consider those with dietary restrictions so everyone can have a great evening! At Stokely Event Center in Tulsa, Oklahoma, we are the party place! We can help you make your engagement party fun and memorable. With lots of games, a relaxed atmosphere, and plenty of space, it’s the perfect venue for your special night! When it comes to planning a wedding or reception, some of the same things apply, but there’s more. In addition to setting a date, guest list, venue, and menu, there are a few other things to consider. Here are some expert tips for wedding and reception planning. 1. Get all the help you can. If it fits in your budget, hire a planer. If not, there are lots of online resources, like this free wedding planning checklist from magnetstreet.com. 2. Get your people together. Besides a wedding planner, there are several people you’ll need to make your wedding and reception happen. Think about photographers, videographers, caterers, DJs, decorators, lighting and sound operators, and of course, your officiant. A good venue should be able to connect you with qualified service providers if you don’t already know who you want to use. 3. Think about your bridal party. Once you’ve set the date, contact them sooner, not later. Yes, your best friends might drop everything to be there, but you should give them as much notice as possible. And as for clothing, unless money is no object, consider choosing a wardrobe for them that they can wear after the wedding, too. 4. Think about the weather. Outdoor weddings are all the rage in some places, but the weather often does not cooperate. Have a backup plan if you want to get married outdoors. This day is about the two of you. Above all, make it fit your personality as a couple. Are you a fun couple? Plan a fun wedding and reception that reflect who you really are! Stokely is the premier engagement and wedding party place in Tulsa! Our fun and casual environment is the perfect place to make all your celebrations unforgettable! Call us today at 918-600-4448 or click here to contact us!